Can you guess who made the final cut? Now that the NFL season is officially over, Pro Football Focus revealed their list of the top 101 players from 2017. Seven Philadelphia Eagles players made the final cut this time around, which is two more than last year’s total. Cox is the highest ranked Eagles player on PFF’s list. He’s the 12th highest defensive player and second overall at his position. Fletcher Cox was good enough in the postseason to leap above Geno Atkins in the rankings overall this season. Cox was the most dominant player on the Eagles defense in their biggest games of the season, giving them a mismatch in the middle of the line that neither the Falcons nor Vikings could cope with. In the Super Bowl, the Patriots fared better thanks to their offense as a whole, but Cox still generated six total pressures, giving him 16 total for his three-game postseason. Strong enough to make even powerful guards look overmatched, Cox can destroy run and pass plays. PFF Elite Stat: Cox ranked eighth among interior defenders with 50 total pressures. Remember when some people when Cox missed OTAs? Remember when some people said it was dumb to give $100 million to a defensive tackle? Well, none of that stuff prevented the Eagles from winning a Super Bowl. Cox was a big part of the Eagles’ ultimate success. The Eagles did a great job of managing his snaps throughout the year so that they could fully unleash him in the playoffs. His ability to stuff the run as well as generate interior pressure is pretty valuable. Hence the big money contract. Kelce is the third highest offensive lineman on PFF’s list. He’s the No. 1 overall center. Philadelphia’s offensive line finished the season as the No. 1 ranked unit in the league, even after losing LT Jason Peters to injury after just seven games. A big reason for that was the bounce-back season from Jason Kelce at center. Kelce came back from a disappointing 2016 season and posted the best run-blocking grade we have ever given a center over 12 years of grading. His ability to take care of his assignment, whether that was a lineman or a linebacker at the second level, was second to none, though his pass-blocking was average over the year, as he surrendered 22 total pressures from 19 games. PFF Elite Stat: Kelce paired a stellar run-blocking grade with a pass-blocking efficiency of 97.5, 20th among centers. Kelce really bounced back in a major way in 2017. Credit to him for working hard to make sure that happened. Also credit to the Eagles for not giving up on him too soon. Kelce deserves to be No. 1 on this list for his Super Bowl parade speech alone. Graham is 17th highest defender and the sixth highest edge rusher. For the first time in his NFL career, Brandon Graham got enough sacks over the season to get some of the credit he has deserved for years and ironically enough, he was even better the previous year when his play went largely unnoticed because he didn’t have those sacks. Graham had 60 total pressures over the regular season and was impressive during the playoffs before making maybe the single biggest play in Super Bowl LII, stripping Tom Brady of the football late in the game and helping to seal the win for the Eagles. PFF Elite Stat: Graham’s run-stop percentage of 13.7 led all edge defenders in the regular season. BLG came up so huge in the Super Bowl. You just knew Tom Brady was going to go down and score. But then Graham made that play and virtually put the game away. From a “bust” to a legend. I never wanna hear “Earl Thomas” associated with Brandon Graham ever again. Only five cornerbacks ranked higher than Robinson. The play of Patrick Robinson for the Eagles this season was one of the surprises of the year, and one of the major reasons this team was able to secure the No. 1 seed in the NFC and ultimately go all the way to a championship. Robinson moved to the slot this season and that saw a career year in PFF grade at 89.8, more than 10 points better than his previous career best. He also made key plays, including a pick-six in the NFC Championship game to turn the game against the Vikings. PFF Elite Stat: Robinson allowed a reception on average every 12.1 slot cover snaps, a mark that was good for 11th among cornerbacks. Back in training camp, BGN alumnus Jimmy Kempski conducted a media poll asking “Which one player has had the worst camp?” 14 out of 30 people who answered picked Robinson. No one had more votes. He was getting burned routinely. It looked like he might be released before final cuts even took place. But then he really turned it around once he started playing more often in the slot. He went on to have the best season of his career. Crazy how that worked out. P-Rob is a free agent so it’ll be interesting to see what happens with him. I’d imagine someone could make a significant offer in free agency. If that’s the case, he should accept it. He deserves a pay day. Brooks is the eighth ranked offensive lineman. Brandon Brooks had an excellent season for the Philadelphia Eagles, exactly matching his career-best overall PFF grade from a season ago with a second-straight 88.0 mark this year. He saved one of his best games of the year for the Super Bowl, where he didn’t allow a single pressure – the ninth perfect game in pass protection of his season – and was an impressive run-blocker against that New England defensive front. PFF Elite Stat: Brooks tied for seventh among guards during the regular season with a pass-blocking efficiency of 97.9. Brooks was named to the Pro Bowl for the first time in his career this season. He also earned PFWA All-NFC team honors. It’s simple: Brooks is just a really good right guard. Four quarterbacks ranked ahead of Wentz: Tom Brady (No. 2), Drew Brees (No. 56), Matt Ryan (No. 58), and Ben Roethlisberger (No. 68). 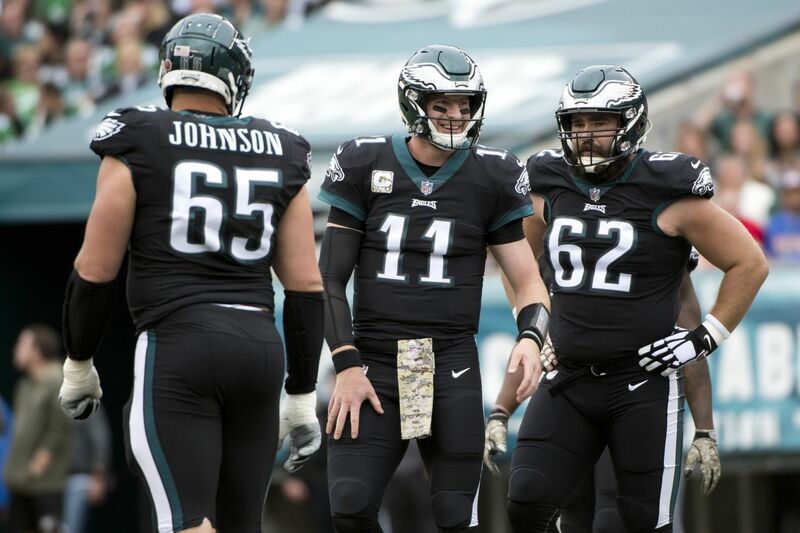 A torn ACL robbed us of the conclusion of a truly spectacular breakout sophomore campaign from Carson Wentz, but the Philadelphia Eagles at least were able to overcome that and continue their run as the No. 1 seed in the NFC all the way to a Super Bowl championship. Wentz was mind-blowing on third down this season, with the minor caveat that he was far from special on first and second down, earning an overall PFF grade of 87.6, a jump of almost 10 points from his rookie year. PFF Elite Stat: Wentz led all quarterbacks with at least 150 play action dropbacks in passer rating on play action passes (104.1). Lol at this ranking. If Wentz didn’t get hurt, he had a real shot at being NFL MVP. And he finishes at No. 81? C’mon. Watch this video and then tell me there were 80 players better than this guy in 2017. Johnson is the fourth ranked offensive tackle on PFF’s list. Capping off another fine season with a Super Bowl championship, Lane Johnson was one of the best right tackles in football once more in 2017. Johnson was impressive in the Super Bowl for the Philadelphia Eagles, keeping a clean sheet in pass protection, marking the sixth game this year that he did not allow a pressure at all. His run-blocking was also excellent, and he was a vital member of an Eagles offensive line that ended the season as PFF’s No. 1 ranked unit. PFF Elite Stat: Among offensive tackles with at least 178 pass-blocking snaps, Johnson ranked sixth in pass-blocking efficiency (97.2). Johnson had hell of a season. This feels low for the guy who made the Pro Bowl, the AP All-Pro first team, and the PFWA All-NFL team. Dion Lewis (No. 76), Jordan Poyer (No. 95), and LeSean McCoy (No. 99) were the only former Eagles players to make the cut.